God’s written message, the very words of the Bible, in the original languages does not change. However, God’s written method may change. Most people believe that God’s written message has always been preserved over the centuries as a single volume of writings. However, that is not so. At times, the Bible existed as scattered writings. Now, copies of individual scattered writings would be made at various times and, during the copying process (though virtually not at all among the Jews with regard to the Old Testament) minute mistakes would be made but mistakes nonetheless. A preword is a “candidate word,” a word that is a candidate for identification as a part of the message of God. Prewords fall into two categories: biblical prewords and nonbiblical prewords. Biblical prewords are eventually identified as biblical words. Now, the MT10-TR-CSR10, which replaces the MT9-TR-CSR9, is identical to the MT9-TR-CSR9 word for word. The difference is that its source, the “Father of All Bibles, ”the Textual Super Matrix, has been expanded to include over two thousand, additional, ancient, biblical manuscripts. This means that the preword pool (the collection of prewords) has grown. We will explain the importance of knowing this in a future article. Computers allow us to do vast amounts of textual work in relatively short periods of time. One example is the extraction of all of the words contained in the King James Bible. 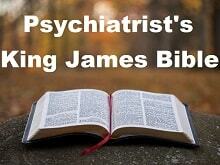 See King James Bible Exhaustive Statistical Word List. (Matthew10:37a) He that loveth father or mother more than me is not worthy of me…. (Matthew10:37a) He that loves father or mother more than me is not worthy of me…. We are now ready to begin the explanation of the actual process of developing the International Authorized Version. The development process involves multiple methodologies (methods, means). We will explain these methodologies one by one. Our primary purpose in doing so is to show the world that the International Authorized Version truly is the next generation of the King James Bible.